Smart TVs are new tending on the television world. This television not offers excellent picture quality but also provides a massive facility to use multiple things. For the high visual and audio quality, there is nothing like Samsung televisions. 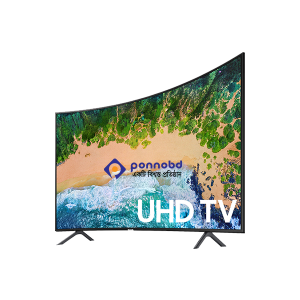 The Samsung Smart Tv price in Bangladesh would very slightly shop to shop, but we can assure you at Ponnobd.com you will get every item just at the right price. We offer a discount price on numerous occasion so all or customer could buy a quality item at a low price. Including the Samsung smart TVs, you can also get the Sony Bravia, LG, Walton, Minister, Pentanik and many more other brands of TVs. What types of features you search when going to buy a smart TV. Is the size, quality of pictures, brand or the price? These are an essential option to look for any television. But the thing is if you go for a Branded product rest are assured. That is why you should get a Samsung Smart TV for your house. All the models of the Samsung smart television supports, Bluetooth connectivity, Wi-Fi, USB port and so many other things. Ponnobd.com has a well-equipped service page where you can filter an item with basic features like size, brand, price, etc. once you tick the section you get an automatic customized result for your search query. Finding a perfect television based on one’s requirement is tough. Like, you may want one from a specific brand but the prize not match with the list of features you want. Moreover, the Samsung Smart TV price in Bangladesh could vary a little one shop to another or one e-commerce site to another. But not in here. Ponnobd.com offers each and every item in here in the best price that you may not find anywhere else. However, we also offer a replacement guarantee for our Television items. You get 12 months of exchange offers for your broken TV. If the item purchased from here and accidentally broke down, you would get a new television once you return the old one. This series of Samsung Android TV is full HD and offer very high-quality sounds and visual graphics. You would enjoy any dram show, animation films, and movies more clean and lively. Plus these smart TVs are supports Screen mirroring, TV and video side view from Android and iOs. These are some popular models of Samsung; there are a lot more models coming soon. Usually, Samsung smart TVs start from 24000- 199000 takas. Samsung offers an extensive range of Smart television collections. You will need different sizes, features of TVs at a different price point. First of all the picture quality of Samsung television is terrific no matter how cheap or expensive it is. We mean, according to the price you get the right performance even more. Second of all the features that they improvise time to time is also impressive. Now you can browse the web world with your smart television, play a live game, shop online, and make video calls and what not! Thirdly, the durability of the product. Yes. It’s one of the large durable Smart televisions in the world. This Korean based company makes your every penny worth for these Smart TVs. Without a service in most case, the consumer can spend 5+ years with the TV. Even if something happens in the future like a malfunction or anything, there will be not that hassle or cost to repair it. And finally the price. This is a debatable option because the appropriateness of rates varies from person to person. Apart from all the elements we mentioned earlier, the amount that attracts most of its consumers. These are not a very cheap one. These are the mid-high range of products but reasonably priced. That means, Samsung TV price is entirely based on what the features and facility a television have. Samsung has a massive collection of Samsung led TVs, Samsung LCD TVs, Samsung HD tv, 4k, and Plasma TVs. These are top selling items of this brand for the last couple of years. Even in Bangladesh Samsung is the preferable option for most of the customers. In ponnobd, we offer a good collection of different sizes and prize of Samsung smart TVs for our customers. And we can assure you all the genuine products are available in our store. If you have a high budget, we will suggest you go for curved or plasma TV starting from 90k. These are an excellent addition for a room with big space. CGI movies or videos are perfect for watching it. For mid to low budget you can go for Samsung led smart tv or LED models so far. These are starts from 23k to 70+ take. All the Samsung smart TVs come with one year of service warranty. Samsung TVs are one of the sold items in every electronics shops. It’s because the brand offers all high-quality products in every budget range. If you have a limited budget, still you can manage to get a smart television from Samsung. In ponnobd.com you get the lowest Samsung smart tv price in Bangladesh. So, take a good look and see which model of Samsung smart TV you are going to purchase. Special note- Every service we offered or mentioned here including price, warranty, guaranty, refund, discount, etc. is changeable with or without giving notice. Pknnobd.com reserves all the rights to modify or alter anything mention in its service page. If you want to know anything or make a query about a product leave us a message with a short description.